At HealthMax Physiotherapy we use Laser Therapy, which is a painless procedure that stimulates cells, creating more protein and assisting in tissue repair. Laser therapy, also referred to as soft tissue laser therapy or cold laser therapy is a treatment used to treat chronic pain. Laser therapy uses the energy from an infrared light to essentially eliminate pain, drastically reduce inflammation and stimulate tissue healing at a quick rate. At HealthMax Physiotherapy, we use BioFlex Laser Therapy as a treatment. Cells which are distressed simply lack energy. BioFlex Laser Therapy promotes energy rich molecules in these distressed cells which will help promote recovery. Distressed cells that undergo laser treatment receive more energy through the infrared light, stimulating soft tissue and accelerating the healing time. Another benefit to laser therapy is the fact that it promotes oxygen in the immediate area, which increases blood flow and assists with circulation within the body to the affected areas. Laser therapy’s most significant benefit is that it stimulates the natural process which occurs in the cell, creating better recovery times and eliminating pain. 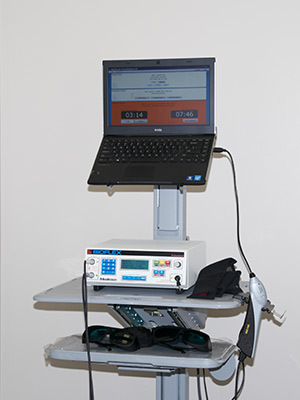 For more information about our Laser Therapy treatments, Contact us today or give us a call at 1-888-712-2720.